Lean In Canada is a community of professional women empowering each other to build purposeful and fulfilling careers. Since 2013, the organization has grown from an audience of 20 people to over 2000 members in various professions. Lean In Canada has built an organization of strong, professional women who are passionate about driving their careers forward to the next level and beyond, and who want to achieve greater success at work and in their personal lives. 108 ideaspace designed and executed a corporate website that both meets the needs of the organization and showcases the vibrant Lean In Canada community. We developed an AODA compliant, responsive website that uses innovative design, high quality content, and email marketing to advance Lean In Canada’s mission and objectives. The stacked design showcases the website’s program and event offerings and creates a visually stimulating scrolling experience. Large, high-resolution graphics taken at Lean In Canada events provide authentic imagery for viewers – encouraging participation and engagement. 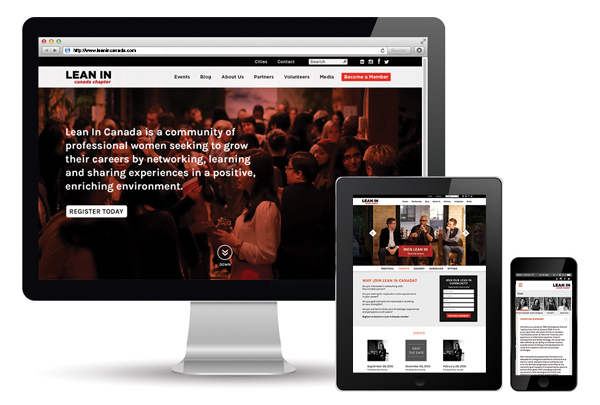 The site navigation and information architecture is designed to provide an accessible and engaging user experience – leveraging thoughtful content to showcase Lean In Canada’s speakers, members, and event attendees. In order to encourage community engagement, we designed the site to be intuitive, accessible and easy to use. The site integrates seamlessly with social media and the email marketing client, Mail Chimp. This allows viewers to view Lean In Canada Instagram pictures, follow the Lean In Canada Twitter feed, and join the Lean In Canada community without leaving the website. We are inspired by the work that Lean In Canada does and we’re proud to partner with an organization that seeks to bring women together to learn from and champion each other in a positive, enriching environment. Since its inception, Lean In Canada’s membership has grown by more than 9000% (wow!). We look forward to continuing to help Lean In Canada grow and to supporting this incredible community of professional women and allies.